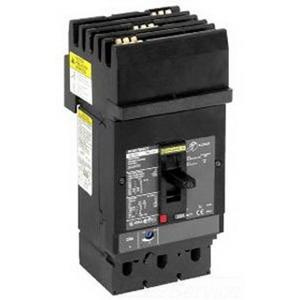 Square D PowerPact J® 3-Pole Molded case circuit breaker is rated at 175-Amps and 600-Volt AC/250-Volt DC. Interrupt current rating of this circuit breaker is 25-Kilo-Amps at 600-Volt AC and 20-Kilo-Amps at 250-Volt DC. It measures 4.12-Inch x 3.44-Inch x 7.52-Inch. This 3-Phase circuit breaker with load side lug terminal connection, accommodates aluminum/copper wire of size 4 - 4/0-AWG. This J-frame circuit breaker with a trip range of 1750-Amps, has thermal-magnetic trip function to ensure reliability. This circuit breaker supports I-line style plug-in mounting. It withstands temperature of 40 deg C. Circuit breaker is UL listed, CE/CSA/CCC certified, RoHS compliant and meets IEC standards.